Habitat: Large salt, brackish or fresh waterways and permanent wetlands. Food: Vegetarian. Algae and weeds. In adult Black Swans the body is mostly black, with the exception of the broad white wing tips which are visible in flight. The bill is a deep orange-red, paler at the tip, with a distinct narrow white band towards the end. Younger birds are much greyer in colour, and have black wing tips. Adult females are smaller than the males. Black Swans are found throughout Australia with the exception of Cape York Peninsula, and are more common in the south. Black Swans prefer larger salt, brackish or fresh waterways and permanent wetlands, requiring 40 m or more of clear water to take off. 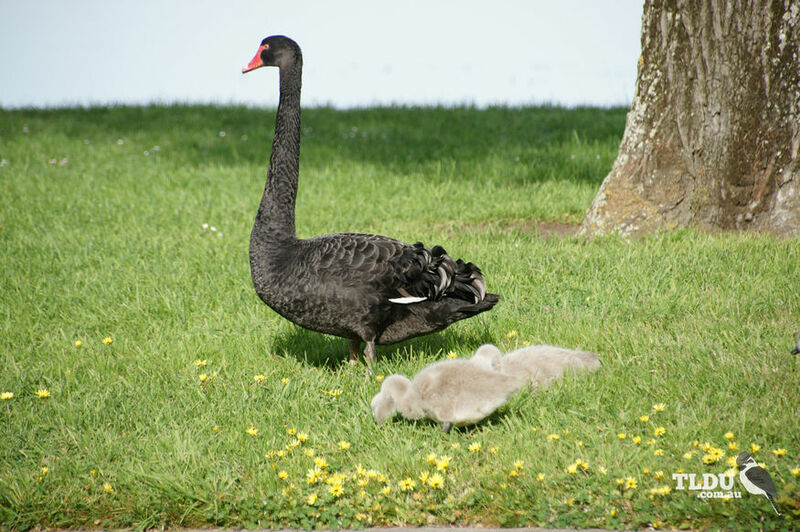 Outside the breeding season, Black Swans travel quite large distances. Birds fly at night and rest during the day with other swans. The Black Swan is a vegetarian. Food consists of algae and weeds, which the bird obtains by plunging its long neck into water up to 1 m deep. Occasionally birds will graze on land, but they are clumsy walkers. Black Swans form isolated pairs or small colonies in shallow wetlands. Birds pair for life, with both adults raising one brood per season. The eggs are laid in an untidy nest made of reeds and grasses. The nest is placed either on a small island or floated in deeper water. The chicks are covered in grey down, and are able to swim and feed themselves as soon as they hatch.